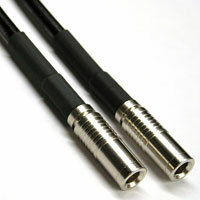 Premium HD-SDI cables, designed with matching impedance connectors to maximize overall electrical length and achieve optimal results. Perfect for Broadcast-Grade video defined by SMPTE259M, SMPTE292M, and SMPTE424M. Broadcast Video Cameras, Serial Digital Video, HDTV upgrades, and Broadband Facilities. Great for high density HD/SDI video distribution routers.